When most people hear the word “abuse,” they think of classic domestic violence, where the man beats his wife. Some abusers are blatant in their aggression, and their rage is clear to everyone. However, there is an insidious kind of abuse that is harder to identify. Subtle abusers can be loving, funny, warm and engaging when they want to be, which makes you all the more unsuspecting. This type of abuser wants to look like the “good guy” while at the same time manipulating, intimidating and threatening you into doing what he wants. His covert aggression allows him to have power and control without you even realizing it. Your gut probably tells you something is wrong, but you have no objective evidence, which means you are left continually questioning yourself. A subtle abuser does not begin the relationship by making critical statements or poking fun at you. Obviously, if he did that too early, you would have no trouble severing ties. His behavior is carefully disguised in the beginning; he conceals the anger and insecurities that boil beneath the surface. Your needs are inconvenient for him. If you get sick, or you’re going through something difficult, he thinks less of you. He is put off by your “weakness” and makes his disapproval and disgust known. He resents the fact that you’re not available to serve him. If he helps at all, it is so that you can hurry up and get back to taking care of him. He believes that “he knows best.” At his core, he is extremely insecure, and he compensates for this by righteously and consistently undermining you, telling you what to think and do. Playing “devil’s advocate” is a common tactic. Not everyone who challenges you by taking the opposite stance is abusive, but if you feel that you are often trying to prove yourself, get permission or gain approval, there is a clear power imbalance. And if you often feel as if you are in a courtroom pleading your case, you are undoubtedly in a controlling relationship. Whenever you confront him about something that’s bothering you, you come away feeling like you are in the wrong. Even when you try your best to assert yourself, you end up giving in. That’s because in any dispute, he uses little shreds of truth to make himself seem more credible, and he embellishes your infractions. He undermines your account of the situation, and you are left, yet again, questioning yourself. When something goes wrong, he invariably points the finger at someone or something other than himself. This pattern typically extends beyond your relationship. If he continually blames others for every misfortune, it is important to take a closer look. Bottom line: Relationships are not supposed to be this hard. You should feel that your partner is looking to understand you, not to disprove or humiliate you. You deserve to feel like your partner is truly a partner, someone to go through life with, not against. 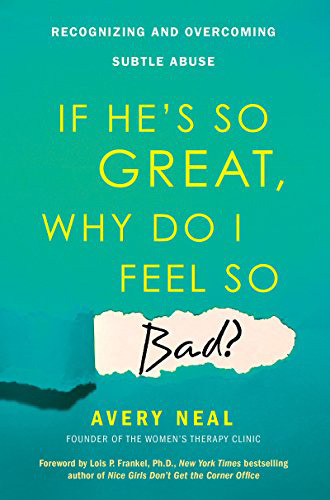 From the book If He’s So Great, Why Do I Feel So Bad? by Avery Neal. Copyright © 2018 by Avery Jordan Neal. Reprinted by arrangement with Kensington Publishing Corp. Published March, 2018 by Oprah.com.